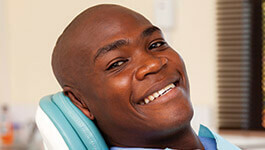 Have one or more missing teeth altered your smile’s health and beauty? As a board certified prosthodontist, Dr. Schumacher has the expertise to replace them with a custom crown and bridge prosthetic. A crown and bridge (also known as a fixed bridge) is a prosthetic that permanently replaces a single missing tooth using a replacement tooth and at least one supportive crown known as an abutment crown. The abutment crowns are placed over the teeth on each side of the missing tooth. Their job is to stabilize the prosthetic for greater functionality and confidence. Beyond replacing a missing tooth and improving your smile’s functionality, a bridge also preserves a smile’s natural alignment. A missing tooth causes surrounding teeth to shift out of alignment over time. Misaligned teeth lead to increased risk of TMJ dysfunction, and give bacteria and plaque places to hide. A full crown and bridge procedure is completed in just two visits. In the first, your abutment teeth are prepared and a temporary restoration is attached. When your permanent restoration has been completed, you’ll return to our Wakefield dental office to have your temporary removed and a custom crown and bridge attached.